On Sunday 29th September, David Tennant attended the BFI Doctor Who Tenth Doctor Screening in London. His episodes The Stolen Earth and Journey's End were screened followed by a Q&A. Also on the panel were Catherine Tate, director Graeme Harper, producer Phil Collinson and casting director Andy Pryor. 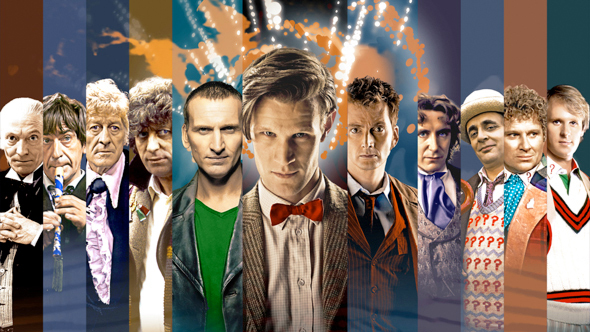 This screening was part of the BFI Doctor Who series throughout 2013 where they screen episodes from each Doctor and then a panel involved in the episode discuss the era and take questions from the audience. Synopsis of David Tennant / Tenth Doctor screening at the BFI. Today David Tennant will attend the Tenth Doctor screening of The Stolen Earth and Journey's End followed by a panel at the BFI Doctor Who 50th Anniversary at 2pm. Tickets sold out for this before it went on sale to the public but it is possible to queue (early!) for returns. Doctor Who News reports that the David Tennant Doctor Who episodes to be screened on Sunday 29th September at The BFI are The Stolen Earth and Journey's End. BFI Champions can enter the ballot on Monday 5th August and members from Tuesday 6th August. The ballots will close on Friday 9th August and all entrants will be notified on Monday 12th August whether they have been successful or not. All tickets reserved for Champions and members via the ballots will be held for claiming by them until 8.30pm on Friday 16th August. Any that are unclaimed by then will be released for public sale on Saturday 17th August. Radio Times reports that the screening of the Tenth Doctor installment of the BFI Doctor Who 50th Anniversary will be on Sunday 29th September at 2pm. It has not been announced whether or not David Tennant will be there. Tickets go on sale first to BFI Members and the previous events have always sold out immediately so now it is done via a ballot for members only.